Within this project we have developed several systems for automatic or semi-automatic indexing and automatic text document and web-site classification based on dozen different methods. Since the primary preprocessing data procedure in all text indexing and classification systems has to deal with Croatian morphology, which is rather complex, a system for approximate automatic lematization of the Croatian language was developed. The particular attention was payed to the development of efficient algorithms for this system and this results represent the first experimental data and algorithms applied to Croatian language in text-classification systems. This procedure could have a significant importance in further automatic procedures in text classification in Croatian. Beside the development of the systems for text indexing and classification which have their value as stand-alone applications (PEI for HIDRA), within this project the test data bases for Croatian text classification have been developed in close cooperation with Institute of Linguistics, Faculty of Philosophy, University of Zagreb. The basic knowledge for further researches in that direction has been collected which will enable the further development of automatic computational methods, for Croatian language. The students of the Faculty of Electrical Engineering and Computing from Zagreb and the Faculty of Organizations and Informatics from Varaždin worked jointly on this project. Also the collaboration with the Institute of Linguistics, Faculty of Philosophy, University of Zagreb, the Croatian Information Documentation Referral Agency (HIDRA) and Joint Research Center (Ispra, Milano) of the European Commission has been established. The project manager had a presentation in the international conference. The collaborators on this project prof. dr. sc. Marko Tadić and mr. sc. maja Cvitaš participated the international workshop. 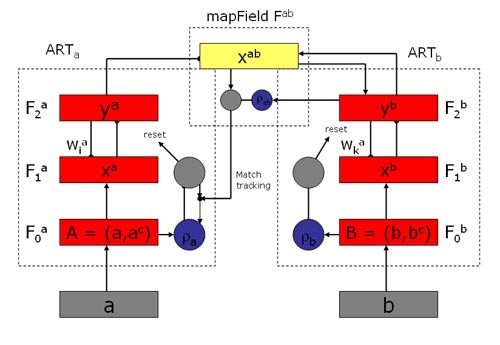 A paper related to deep text analysis has been published in a scientific journal. Four diploma theses were completed within this project and one of them was rewarded with "Stanko Turk" prize for an outstanding work. A web-site with the detailed results description of this i-project was designed and it has been used as a portal for deep data and text analysis domain (data and text mining). This web-site is also a principal spot for discussion regarding prospective activities of group teachers and students from the Faculty of Electrical Engineering and Computing who occupy themselves with data and text mining. XXIInd International Biometric Conference (IBC 2004) in parallel with the Australian Statistical Conference (ASC, Cairns, Australia, 2004). 11 - 16 July 2004. Addressing the Language Barrier Problem in the Enlarged EU, Automating Eurovoc Descriptor Assignment, JRC Ispra, Italy, 16-17 September 2004. Dobša, Jasminka; Dalbelo Bašić, Bojana: Comparison of Information Retrieval Techniques: Latent Semantic Indexing and Concept Indexing. Institute of Linguistics, Faculty of Philosophy, University of Zagreb, Projects 0130418 "Development of Croatian Language Resources"
Within the cooperation with HIDRA, an Semiutomatic Document Indexing System with EUROVOC Descriptors has been developed (see the details here ###html-link). Further collaboration with HIDRA has been initiated with the purpose to develop and implement the fully Automatic Document Indexing System using EUROVOC descriptors. This collaboration will proceed between The Faculty of Electrical Engineering and Computing (FER), Croatian Information Documentation Referral Agency (HIDRA) and Faculty of Philosophy (FFZG) that are starting a new project organized around that tast. Cooperation is based on the problems regarding the automatic indexing using EUROVOC descriptors. 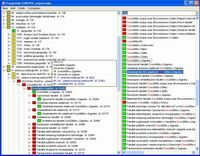 Dr. Steinberger bit će pozvani predavač na ITI2005 s temom vezanom za pretraživanje teksta. SAS Adriatic donated this project with the SAS® Text Miner module for experimental purposes. 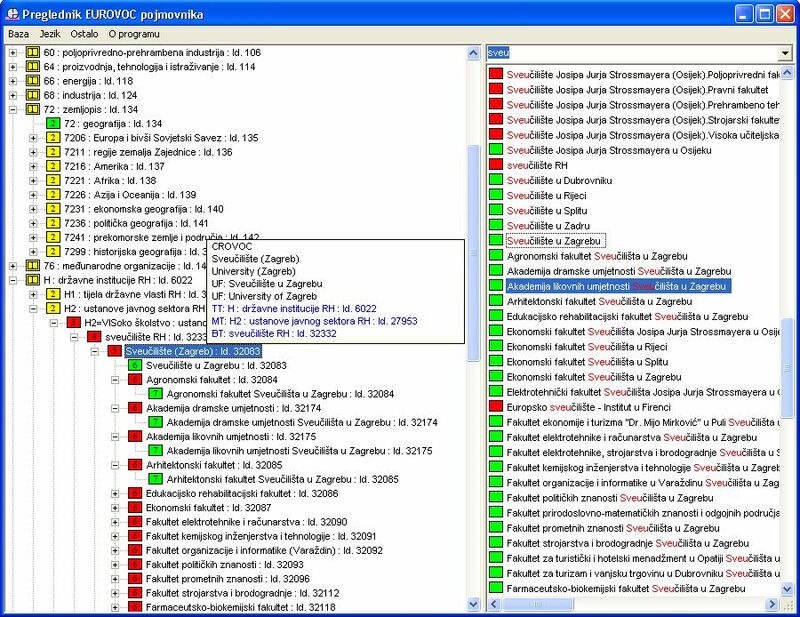 Several exeriments were made on Croatian and English text databases. The results revealed that SAS text preprocessing is good enough for Croatian language deep analysis but better result are achieved using lemmatized databases. Experiment descriptions and results are attached in the report. Bereček Boris, Cvitaš Ana: "Deep text analysis on Newspaper Vjesnik Database and Croatian-English Parallel Corpus Croatia Croatia Weekly using SAS® Text Miner-a, FER Zagreb, 2005. Mislav Malenica: for the "Text categorization appliance core methodes",, diploma thesis, the Faculty of Electrical Engineering and Computing in University of Zagreb, Zagreb, October 2004. Through the established cooperations which were mentioned in section 5, further project development is planed with automatic document and web-site classification experiments, and automatic document indexing as well. All further activities will be published on this web site: http://www.zemris.fer.hr/projects/textmining/. At least three papers are expected to be published in the near future.